Think of this as a delicious twist on a traditional greek moussaka! It’s a perfect balance of sweet swede, savoury lamb and salty feta so dig in! 1. Take a large pan and heat the oil over a medium/ high heat. Brown the lamb and remove using a slotted spoon and set aside. Drain any excess fat before cooking the onion and garlic for a couple of minutes over a medium heat. Add in the chilli, oregano and nutmeg for a further minute. 2. Next up goes the tomato puree to cook out for another couple of minutes before adding a healthy splash of white wine. Wait for this to reduce by half and then pop in the stock and tinned tomatoes. Season well. Simmer for half an hour until starting to reduce and then remove from the heat. 3. Take one large or two medium size ovenproof roasting dishes and lightly oil. Add a layer of the thinly sliced swede before adding the lamb and then another layer of swede. Preheat the oven at this stage to 190c/ 170 fan. 4. You then need to make the sauce for the topping by taking a medium-sized pan and melting the butter and flour together. Stir well before gradually adding the milk. Bring up to the boil and then lower to a simmer and cook until you have a smooth sauce. Remember to keep stirring! Take the pan off the heat (this is really important) and then crack one egg into it and whisk in well to combine. The egg thickens and enriches the sauce so it is a worthwhile addition. Next in goes 100g of the feta and stir well again. Pour the sauce over the lamb and swede before crumbling the remaining 100g of feta over the top. 5. Cover the dish with foil and bake in the oven for 45 minutes before removing the foil and then cooking for another 30 minutes until golden and bubbling. Serve with bread or greens. I served mine with purple sprouting broccoli which I had steamed lightly before finishing in a frying pan along with a small knob of butter, panko crumbs, one anchovy and a clove of garlic which complemented the lamb perfectly. Lamb, swede and feta bake- a break from the ordinary! 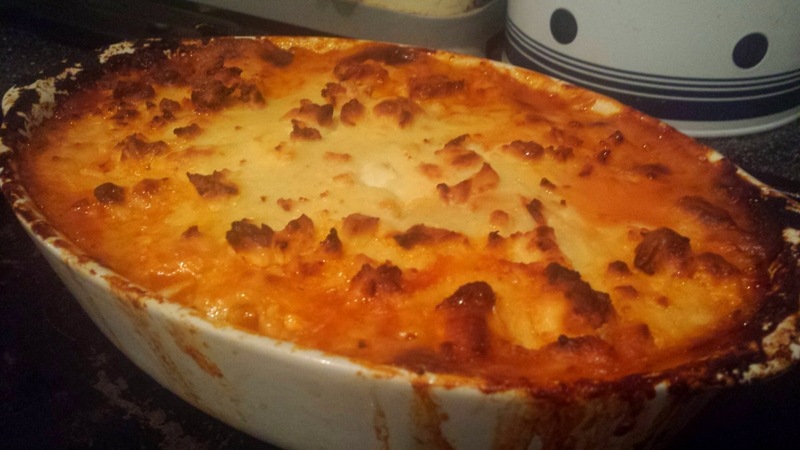 This entry was posted in Recipes and tagged feta, Greek inspired, lamb, moussaka, swede by sotiris14. Bookmark the permalink. Thanks Helen. You’re a star!